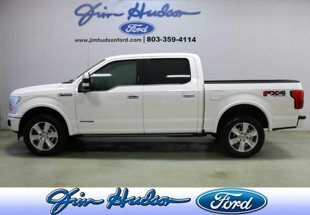 This Ford F-150 XL 4WD SuperCrew 5.5' Box comes equipped with 4 wheel drive, which means no limitations as to how or where you can drive. Different terrains and varying weather conditions will have no effect as to how this vehicle performs. The 2019 Ford exterior is finished in a breathtaking Oxford White, while being complemented by such a gorgeous MED GRAY CLOTH 40CONSOLE4 interior. This color combination is stunning and absolutely beautiful! There is no reason why you shouldn't buy this Ford F-150 XL 4WD SuperCrew 5.5' Box. It is incomparable for the price and quality. Based on the superb condition of this vehicle, along with the options and color, this Ford F-150 XL 4WD SuperCrew 5.5' Box is sure to sell fast.